No. 1 seed women’s basketball has reached its third consecutive Sweet 16 with a 71-50 win over No. 8 Michigan. The Cardinals now move to Albany, New York to play in the round of 16 and potentially the Elite Eight. Louisville will face the winner of No. 4 Oregon State and No. 5 Gonzaga on March 29. 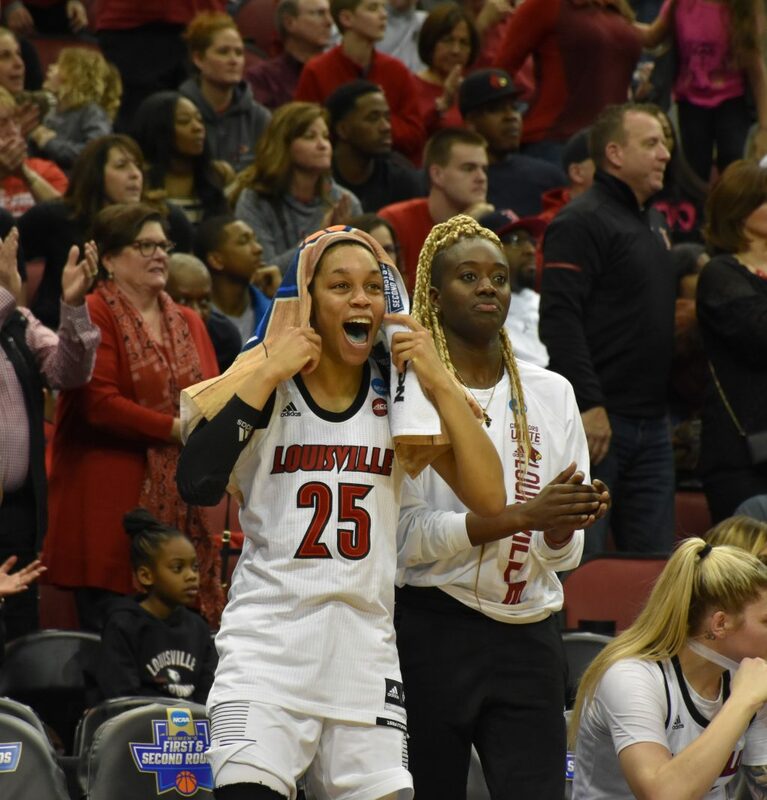 Asia Durr, Arica Carter and Sam Fuehring kissed the Cardinal at mid-court and ran a victory lap around the hardwood after the game, celebrating their final win at the KFC Yum! Center. They will depart the program as the winningest class in program history. The seniors and their teammates combined for a great offensive and defensive performance against the Wolverines. Louisville capitalized on 22 turnovers from its opponent and outscored Michigan each quarter. Durr scored 24 points, including five three-pointers, with five assists and two rebounds. Fuehring followed with 10 points and two rebounds, looking healthy after her bout with injuries in the ACC tournament. Carter only scored two points, but she also notched seven rebounds and three assists in her first NCAA tournament game this postseason. Junior Jazmine Jones shot a great 7-for-12 from the field for 15 points, along with four rebounds and four assists. Sophomore Dana Evans added 10 points at point guard as she continually demonstrates how she deserved ACC Sixth Player of the Year honors. With so much success in recent years, it’s easy to forget the amount of growth that Louisville women’s basketball has experienced. The Cardinals have reached the NCAA tournament 11 times in the last 12 seasons, along with three Final Fours in the last 10 years under coach Walz. Earning an appearance in the round of 16 is no easy task. And with each successive win in the Big Dance, the Cards continue to build their brand on the national level. This year, Louisville arguably faces the toughest route to the Final Four out of all No. 1 seeds. Assuming they win their next game, the Cards will most likely face No. 2 Connecticut in the Elite Eight. On the one hand, U of L knows it can beat UConn. Their meeting during the regular season resulted in a solid 78-69 victory for the Cardinals. On the other hand, the Huskies have yet to lose a game since their loss at Louisville and probably remain hungry for revenge because of the defeat. UConn has also reached the Final Four every season across the past 10 years, so U of L should remain wary that they might be approaching their most difficult matchup in the 2018-19 season.